Comparing with the most commonly used 14 inch decanter centrifuges, the GNLW452 and GNLW453 Decanter Centrifuges of 18 inch bowl and GNLW553 decanter centrifuge of 22 inch bowl are already called big bowl centrifuges. In this case, the newly on show GNLW764A-VFD Decanter Centrifuge could be a giant centrifuge, because the bowl diameter is 30 inch while the length-diameter ratio is 4.4 to one. This design is suitable for handling the large capacity with a single unit of centrifuge. And the special design and best material chosen makes the GNLW764 decanter centrifuge to have a good performance and longer service life. Besides GNLW764A-VFD decanter centrifuge, GN also has designed GNLW554D-VFD decanter centrifuge, which is also of large length diameter ratio up to 4, it is quite suitable for the waste water treatment projects. 1. Electric components are of Siemens, ABB or Schneider, all of world best brands. 2. For the VFD control panels, GN provide positive pressurized control panel and has air conditioning system for cooling as option. 3. Bowl main body material is made of duplex stainless steel SS2205. 4. Impeller protection is with tungsten carbide tiles, for longer service life and easier keeping the dynamic balancing. 5. Solids discharge port is made of special ceramic or tungsten carbide inserts, to have a longer service life. 6. Flexible adjustable liquid level ponds, to change the drying level of treated material. 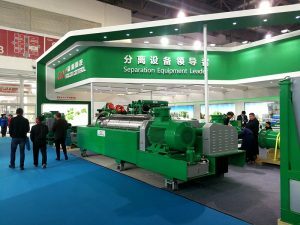 Also, for the CIPPE 2017 which was held in Beijing, GN Solids Control also showed the fully hydraulic decanter centrifuge, of 14 inch bowl diameter. It is preferred by some clients from extremely high temperature condition and where the electric power is limited. 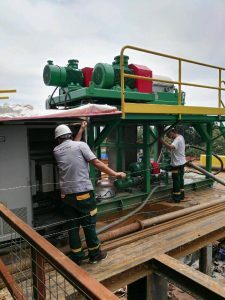 GN decanter centrifuges are widely used for drilling rig solids control system, the drilling waste management system, for the dewatering system, for TBM project separation works, and also for the oily sludge separation projects and soil remediation projects. If you have any question or need more information, please fell free to contact GN sales team directly or visit GN factory near Beijing, Capital of China.